The Partnership worked with the city of Sheridan to explore land use allocations and parking issues in Historic Downtown Sheridan. Parking allocations are based on a 1996 parking study and a 2005 update to that study. Land use allocations combine planimetric data of the study area with land-use data from the Sheridan County Assessor's database. Map (left) indicating study area parking locations from the 1996 study and chart (right) indicating numbers and types of spaces. 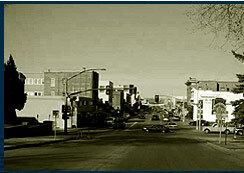 Modeling Downtown Parking Requirements with Planning Support Systems in Sheridan, Wyoming.